I have the Schmitt trigger op amp on the below diagram. (channel A & B refers the oscilloscope probes on the following figures). The resistor values are selected to set the trigger threshold as ~9.5 V and ~5.1 V and I use this page to verify the threshold values. 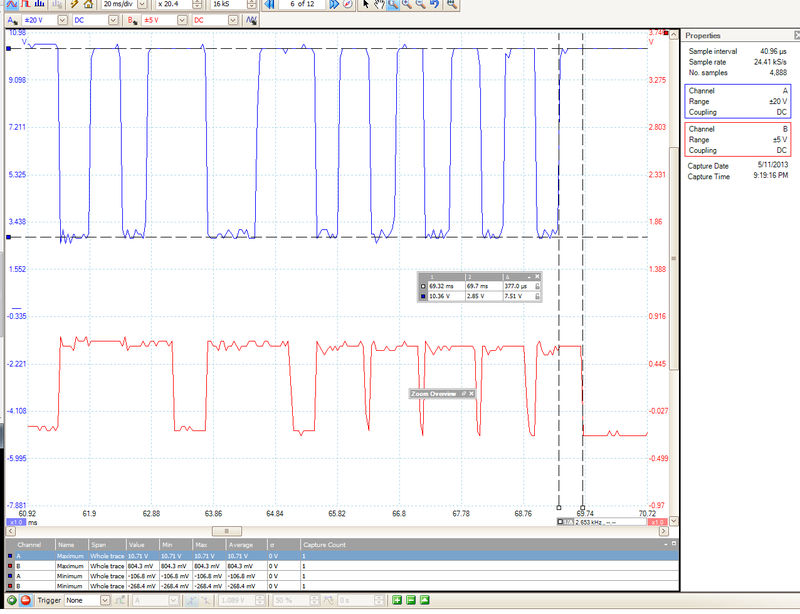 However, the oscilloscope output below shows that the comparator handles the signal on the left side(High=10.71 V; Low=-106.8 mV) correctly, but it fails for the signal on the right side (High=10.36 V; Low=2.85V). The signal is not only handled wrong, it is also extended 377 usec on the time domain. However, there is no time extension on the signal on the left side of the first oscilloscope figure. 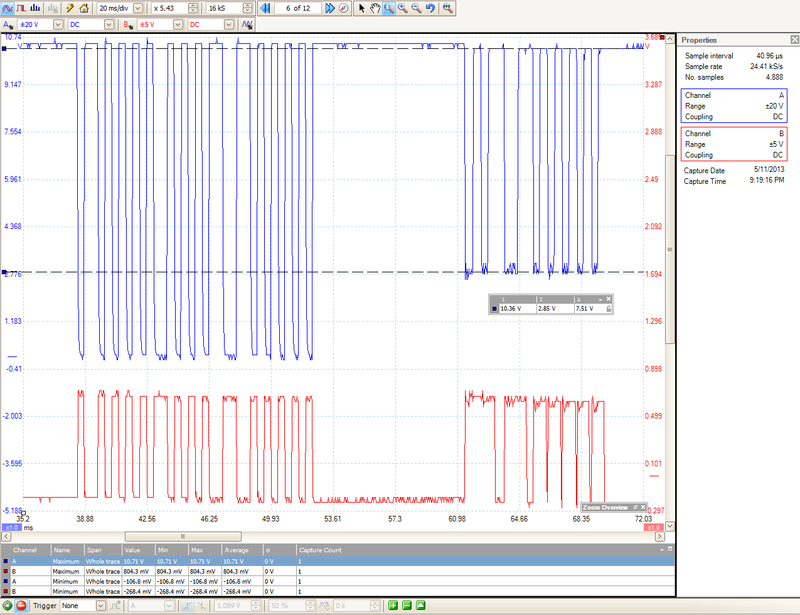 Could anyone tell me why the comparator does not handle the second signal and how it can be solved? Note that the LMC6772 chip you are using is not an opamp; it's a comparator that has an open-drain output. Since it can't actively drive its output high, the Schmitt trigger circuit won't work as designed. The datasheet says, "Refer to the LMC6762 datasheet for a push-pull output stage version of this device." Do NOT switch to the push-pull version of the chip unless you also add a current-limiting resistor in series with the LED. Note also that the website you used to calculate your resistor values is assuming that the opamp in question has bipolar supplies, and that the output swings to -Vcc when the output is "low". Your opamp is being powered by a singled-ended supply, which makes the lower threshold 7.56V when the output is low. So, the actual threshold voltages of your circuit are 7.92V when the output is at 1.8V and 7.56V when the output is at 0V. But you're right, these thresholds should work fine in your application, and they don't explain the problems you're seeing. I can only surmise that you're seeing some secondary effects arising from the fact that you're trying to operate a "micropower" comparator at some fairly high voltage and current levels. The comparator you use has open drain output. This means the output of the comparator can only be actively pulled low. The calculations you use are for a push/pull output. A possible solution is to increase the values of your resistors by a factor 100 and add a 1k pull up from comparator output to Vcc. Not the answer you're looking for? 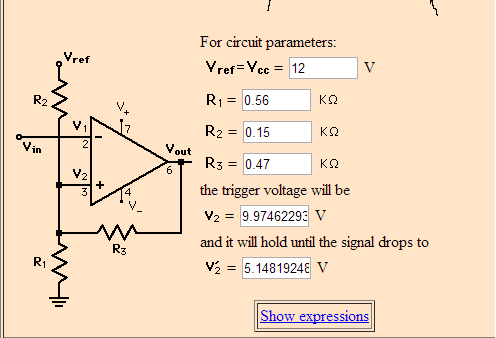 Browse other questions tagged voltage operational-amplifier comparator schmitt-trigger or ask your own question. How to build a Schmitt trigger using transistors?